It’s almost that time again – Valentine’s Day! With the much anticipated release of Red Velvet Oreos, I just had to make a dessert with these. 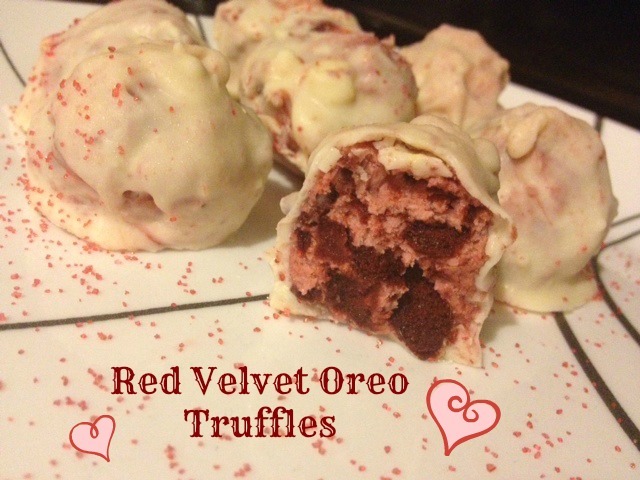 Oreo truffles have always been a favorite of mine and you can’t disappoint my fiancé with any type of Oreo, so this clearly became the recipe I decided to make. 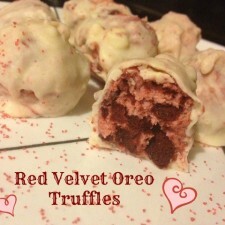 I love Oreo truffles because they always come out absolutely delicious and take no time at all to make. Plus, I actually enjoy making these! Now when it comes to melting white chocolate, this process can be very temperamental. My secret ingredient for making my white chocolate so smooth is coconut oil. If I even try to melt white chocolate on its own, I get clumps and it is just a mess. 1. Crush Oreos and place in a large bowl. Add softened cream cheese. Mix all ingredients until fully combined. 2. Roll mixture into balls and place on a lined cookie sheet. Freeze for 10 minutes. 3. Meanwhile, heat white chocolate and coconut oil over a double boil on medium-high heat. Make sure to watch the temperature of the white chocolate or clumping will occur. Stir consistently. 4. Take Oreo truffles from freezer and dip each one into chocolate minute, making sure to give an even coat. Drizzle extra chocolate on top if needed. 5. Freeze for another 5-10 minutes to solidify and add sprinkles if desired. Enjoy! The finished product is beyond amazing – I promise you won’t be disappointed! For other Valentine’s Day dessert ideas, be sure to check out my Cheesecake Brownies, Raspberry Chocolate Hearts, or Chocolate Truffles.